WASHINGTON—Having failed to prevent Donald Trump from securing their party’s presidential nomination despite a deliberate and concerted effort, members of the Republican establishment admitted being quietly relieved Thursday that the GOP was no longer their responsibility. “Boy, we were really struggling there for a bit trying to satisfy our base while delivering a more inclusive message to appeal to nontraditional Republican voters. It was a total headache, so it’s actually pretty nice that it’s completely out of our hands now,” said Republican National Committee chairman Reince Priebus, adding how glad he was that he no longer had to endure endless meetings about devising optimal policy positions, countering Democrats’ messaging, or developing a general-election strategy. “There were a few things we’d been working on, like trying to get a comprehensive immigration reform plan together, which I’m upset we won’t get to see through. But to be honest, that would’ve been a ton of work to pull off. 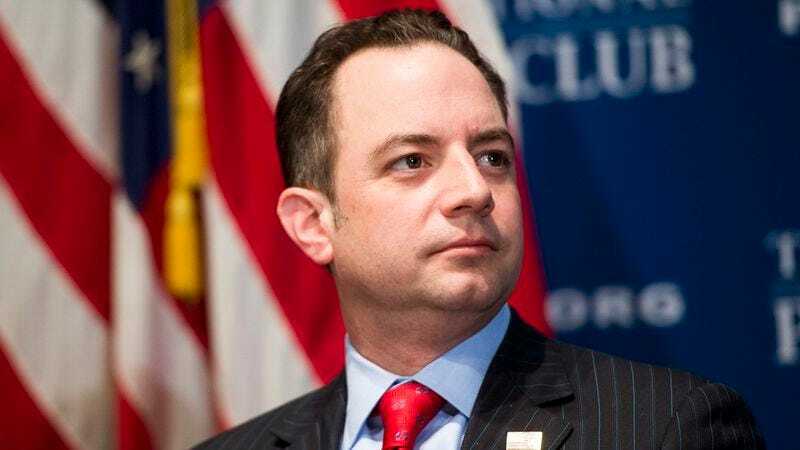 The party was getting to be a real handful, anyway, so it’s way less stressful to just sit back and know that, whatever happens from here on out, it’s not on us.” Priebus acknowledged to reporters that, although he and the rest of the Republican establishment planned on regaining control of the party after a likely Trump loss in the general election, he actually wouldn’t mind being free from overseeing the GOP for the next four or eight years.